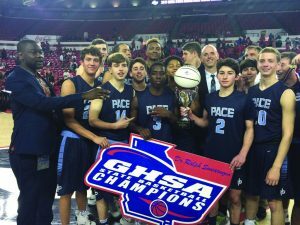 Back to Back: The Pace Academy Knights defeated the Macon County Bulldogs 54-46 at The University of Georgia’s Stegeman Coliseum on Thursday, Feb. 9 to win the GHSA AAA state championship. Pace started out cold concerning shooting and despite getting the double bonus, struggled from the free throw line. The Knights picked up energy going into halftime with points from senior Wendell Carter Jr., junior Isaiah Kelly and freshman Reign Watkins. The Bulldogs installed a physical defensive game plan to guard Wendell, but the 6’10 Duke signee was too much for the Bulldogs, finishing with 17 rebounds and 20 points, many of which came from the free throw line. Perhaps the Knights’ best game of the season was the memorable home matchup in the Elite Eight versus #1 Westside-Macon. The Inman Center was absolutely packed with basketball fans from all over the state, including Georgia Tech head coach Josh Pastner, spectating from the bleachers, mezzanine level and indoor track. “I’m not sitting here making excuses, but their crowd was a big-time advantage to them,” said Westside head coach Josh Grube to the Atlanta Journal-Constitution. The Knights’ journey to state began in June with summer workouts with Strength and Conditioning Coach Clement Rouviere and extended all the way through Spring Break. The team clashed with fierce competition ranging from games against The Patrick School (New Jersey) that aired on ESPNU and Norcross High School (Georgia), both top ranked within the top 20 in the nation. Throughout competition in region 6-AAA, the Knights were dominant. Their only loss was early on to Cedar Grove High School, but was later avenged in the region championship on Feb. 2. The Knights conclude yet another terrific season under Coach Smith with both region and state championship trophies and an impressive 20-8 record.